Home to the “Great Cannock Run” and an Area of Outstanding Natural Beauty, Cannock is one of the most beautiful towns in West Midlands. The small town is densely populated and is placed at a central location in the region with many main roads connecting it with the mainland regions of Birmingham and other close by surroundings. To accent and complement the outdoors beauty of the town, Impress Blinds presents some of the most beautiful and design oriented Cheap Windows Blinds that make interior windows and walls look amazing. We provide Made to Measure Blinds in many different styles, materials, colors and designs that can be used specifically with differently styled interiors complementing their design appeal beautifully. 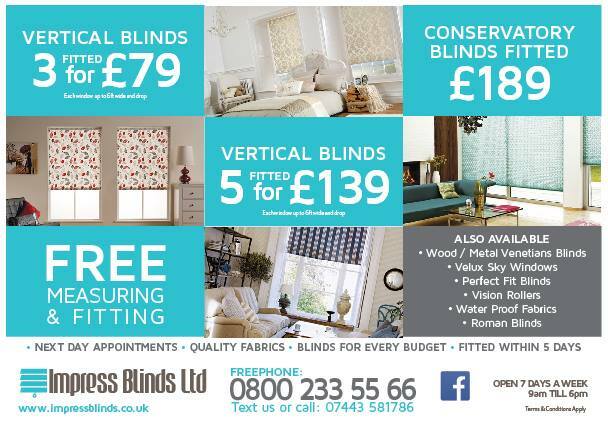 Impress Blinds also offers highly accomplished add-ons like free window measurements and free fitting at your location in Cannock making our products and services highest value for money in the region. Our different types of windows blinds include the daylight and privacy maximizing Vision Blinds (also referred to as Visionary Blinds) that have surface perforated patterns and designs for an elegant always-on design look, the highly design friendly Cheap Roller Blinds that can be printed with any thematic or unique designs, the perfect Conservatory Blinds for all the home extensions in Cannock, the unique and exquisite Vertical Blinds that are the best option for large windows or many other fine quality windows blinds. Also have a look at our Wooden Blinds with real wood materials, Metal Venetians with durable aluminum strips, Cheap Roman Blinds that are made from fabric materials and are perfect for dark cozy rooms or the Velux and Shutter Blinds for complete window blockage. Cannock is known for its surrounding natural beauty that includes many beautiful landscapes, lush green fields and naturally alluring views that please the eye. Why not continue this thematic design for your interiors as well. Impress Blinds offers our perfectly design printable Roller Blinds that are made from one large piece of material, which can be available in any required printed design. Our beautiful Roman Blinds are made from fabric materials that can also be finished in any required colors and printed designs. For natural wooden designs heavy interiors and rooms, we also have the luxury look and feel Wooden Blinds that use real wood strips polished to shiny perfection and beautiful woody patterns. Try our Made to Measure Blinds in any of their different materials and forms and they will not fail to WOW you with their exquisite finish. Our major clients in Cannock (UK) are much satisfied with our services.